Already an 18-time Isle of Man TT winner, Michael Dunlop’s place at road racing’s top table is safely secured. At 29, the Ballymoney man is the third most successful rider ever around the 37.73-mile Mountain Course behind his uncle Joey (26 wins) and John McGuinness (23). Dunlop’s recent announcement that he will race on in 2019 presents an opportunity for more TT success as he aims to add to his haul of silverware in June. Since his maiden victory in the Supersport class in 2009, the Northern Ireland rider has established himself amongst the greats at the TT, producing many of the event’s standout moments over the past 10 years. A debut Superbike triumph on the Honda TT Legends Fireblade in 2013 was a massive personal achievement for Dunlop, who has gone on to scale even greater heights. 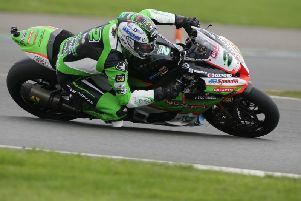 Back-to-back four-timers in 2013 and 2014 underlined a period of dominance and a treble in 2018 included victories in the Superbike, Supersport and Lightweight classes. Here, we take a look back at Michael’s 18 Isle of Man TT victories with a special picture review. To view this gallery, simply click the icon on the image above or alternatively click the link, also above.